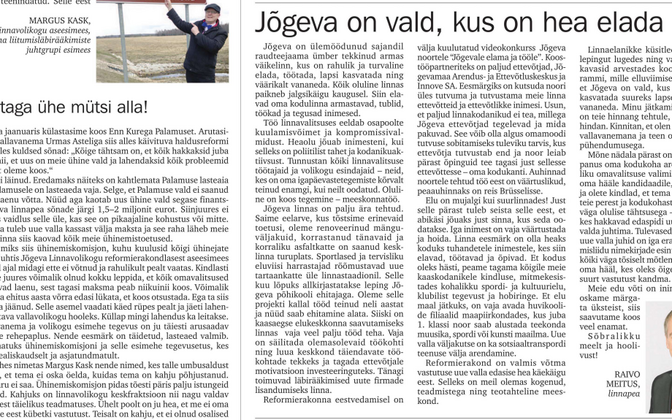 Welcoming the recently published findings of an audit conducted by the National Audit Office, the Estonian Newspaper Association (EALL) noted that the audit results highlight brainwashing and distortion in the advertising market by some municipal newsletters. The newspaper association also warned that solving this problem cannot be regarded as the duty of the municipalities alone. "We have been pointing out for years that the actions of some municipal newsletters have brought with them a democratic problem and unfair competition on the advertising market," EALL managing director Mart Raudsaar said on Thursday. 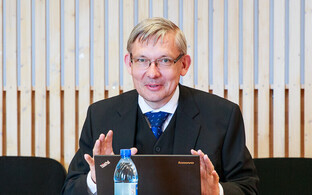 "A few years ago, a high-level meeting with politicians took place in the Riigikogu which concluded with a recommendation to contact the Chancellor of Justice or the Estonian Competition Authority," he recalled. "The Chancellor of Justice, in turn, recommended that those who have a problem take it to court. But we all have a problem, and this problem must be dealt with by the legislature." According to the association, when a large portion of space in a municipal newsletter produced at taxpayers' expense is taken up by the eulogies of those in power, this poses a threat to democracy. When paid advertisements are published in a taxpayer-funded newsletter, it added, this distorts the advertising market. The EALL found that this situation could be solved by adopting a legislative amendment defining a publication produced with local taxpayers' money as a local newsletter meant for informing residents about the actions of the local government and the community. The amendment should also ban the publication of paid ads, including classifieds, in such publications. Likewise, in order to prevent political brainwashing, local government associations should establish a self-regulatory body to handle the complaints of biased coverage in such newsletters. 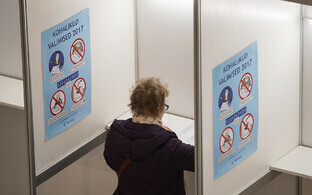 An audit conducted by the National Audit Office has demonstrated that while the majority of municipal newsletters had not been used to promote personal partisan interests ahead of the 2017 local elections, there were nevertheless other signs pointing toward local government funding in some municipalities going toward election campaigns or other political image-building in various forms. Within the period of review, which ran from January through October 2017, local governments published a total of 202 newsletters. The National Audit Office's review covers 191 thereof which were available in a digitally processable format, according to a Thursday press release. The National Audit Office discovered problematic messages in the newsletters of altogether 53 pre-reform local governments, some of which were clearly inconsistent with the principle set forth by law that local government funds may only be applied toward the performance of local government duties and in the public interest. Examples of such messages included appeals made from an official position to vote for a specific person, articles essentially merely blatantly praising a specific candidate, and the unbalanced criticism of political competitors. In addition to the above categories, the audit also identified certain borderline, or "grey area," cases, which included signs of political motivation, but where links to the needs of the municipality as such could not definitely be ruled out. Examples of such "grey area" cases included an abnormal increase in the coverage of activities of the head of the local government in the time leading up to the elections (eg newsletters suddenly start publishing opinion pieces penned by local government leaders where they had not done so before, or including portrait photos next to opinion pieces, or illustrating the actions of local government leaders on several photos in a single issue); summaries of achievements of those in power during their terms of office; giving frequent praise to the local government leader within the regular flow of information; praising the public policy positions of the political union exercising public power in the municipality. The National Audit Office has recommended all local governments that finance newsletters create an internal set of rules to mitigate such risks. Among other suggestions, the auditing body recommended arranging for supervision, eg establishing an independent council for the newsletter to monitor the content thereof; such bodies already exist in some municipalities. The council should also include members of the opposition as well as independent experts, they added.